Supplementary material reads: "Chernus -- Harbor. Captions. Fisherman's fiesta. 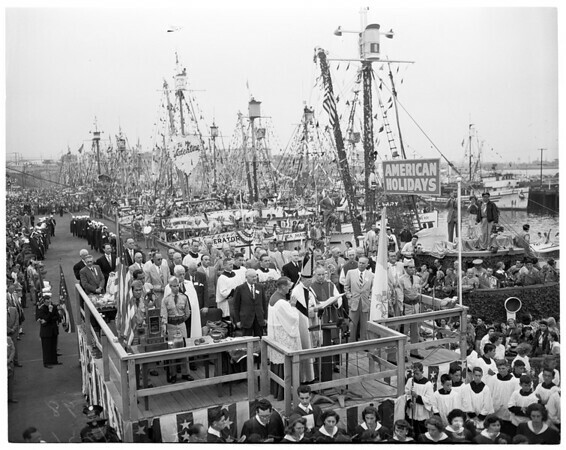 #15/16: Skipperette Peggy Kerns, flanked by her two mates, Mary Trutanich and Dolores Tregarthen, waves to crowd from her throne aboard fishing boat Coral Sea. #1: Shows the fishing boat St. Aniello with Fourth of July motiff churcning down main channel of Los Angeles harbor. #2: Adjudged first prize winner is the Endeavor with Haloweedn motife. American Holidays was theme of parade viewed by more than 100,000 spectators. #5: Second place winner was the Veteran, a purse seiner decorated with Valentine Day motiff. #3: Third prize winner was the Maria decored with towering figure of Christ in Christmas scene decoration. #6: Shows the Progress with a Happy Easter decoration. #1: Shows the Oakland, fourth place, decorated also in Haloweed motiff, with huge pumpkin on stern. #17: Shows Maria and towering figure of Christ, #18: Shows three winners. L to R: Endeavor, Veterann, and Maria".